I work 21 hours a week. 16 of those are on Friday and Saturday. I know how to party on the weekends! So, to get this party started, I am linking up to my two new favorite blogs. Why are they my favorite, you may be asking. No? I'll tell you anyway. They are hilarious ladies! I need people in my life that make me laugh. They are my new BFF's! Okay, maybe not technically, but they are BFF's in my head and that's important stuff! 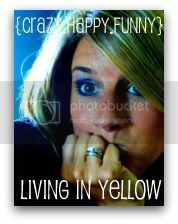 Erin blogs at Living In Yellow. See her little blog button here that says, "Crazy, Happy, Funny"? That's her! She is adorable and can laugh at herself. Love her! Go ahead, click on her button, I'll wait! I just became BFF's with Mandi this morning when I discovered her blog, Tidbits from the Treymanes. Go take a peak at her header. Perfectly funny! It's now 8:01 AM and I've spent the last 32 minutes reading her posts. She is one talented and funny lady! She proclaims her work to be sloppy and that's how I would describe my little projects I have around the house. That's why we're BFF's? Just look what she's done to her house! This is her pantry door. Her pantry door! I love it. I would totally do this if all that nailing of the molding around the door didn't scare me! I've seen these photo strips in several different places, but Mandi shows you how she did it. This will be in my house. Except with my kid's pictures. Because it's one thing to copy someone's projects, but a whole 'nother thing to put their photos up in your house. This will be mine. At least after my 16 hours this weekend! Okay, I'll go see them.